Facilitating with Ease! 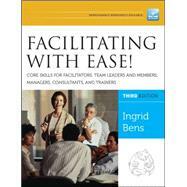 offers a revised edition of the best-selling resource that includes easy-to-follow instructions, techniques, and hands-on tools that team leaders, consultants, supervisors, and managers have used to learn the basics of facilitation. New to this edition is information on why and when leaders should facilitate and how to manage neutrality; new material on diversity, globalization, new technologies, employee engagement; a wealth of new tools, techniques, and tips on when leaders should facilitate and when others should do it, a tool for sharing facilitation with other; and a website that includes meeting design template, surveys, and questionnaires. Ingrid Bens is a consultant and trainer whose special areas of expertise are facilitation skills, team building, conflict management, and employee and organizational change. Bens is the founder of both Participative Dynamics, a consulting firm located in Sarasota, Florida, and Facilitation Tutor, an on-line learning portal. What Are Typical Facilitator Assignments? How Assertive Can a Facilitator Be? Chapter 2 Who Can Facilitate?